Why the Bible has so many prostitutes. What’s with all the prostitutes? There’s scarcely an unmarried woman in the Bible so far who isn’t a prostitute, or treated like one! There’s Tamar, who turns a trick with her father-in-law Judah. The Moabite women, who whore themselves to the Israelites. The Midianite harlot who’s murdered by Phineas. Jacob’s daughter Dinah, whose loose behavior sparks mass slaughter. No wonder they call prostitution the oldest profession — it’s the only profession that biblical women seem to have. I have a rudimentary theory about this. In many tribal cultures, women have been essentially banished from the public sphere in order to control their virtue. We see this in strict Islamic cultures today, where women are punished for speaking to men besides their husbands and relatives. Throughout the Bible, the Israelites have been obsessed with controlling the sexual behavior of their girls and women — this is why there are so many darn laws about female purity, sexual misbehavior, and intermarriage. The Israelite women seem to have played no role in public life. Except for Moses’ sister Miriam (and, in passing, Noa and her sisters), there hasn’t been a single woman since the Exodus who’s had any kind of public responsibility. So, why do we read about prostitutes? Perhaps because prostitutes were the only women involved in the Israelites’ public life. The Maps of War site has a wonderful animated map of the Middle East depicting the rise and fall of the various empires that have controlled that contested region over the centuries. Researchers in Scotland reported a 31-percent reduction in the risk of heart attacks among men taking the statin pravastatin, sold by Bristol-Myers Squibb under the brand name Pravachol. Due in part to this study, Pravachol became one of Bristol-Myers’ most profitable drugs and now grosses more than $2 billion in sales per year. A 31 percent reduction in heart attacks, after all, seems impressive. Yet this pervasive way of describing clinical trials in medical journals — focusing on the “relative risk,” in this case of heart attack — powerfully exaggerates the benefits of drugs and other invasive therapies. What, after all, does a 31 percent relative reduction in heart attacks mean? In the case of the 1995 study, it meant that taking Pravachol every day for five years reduced the incidence of heart attacks from 7.5 percent to 5.3 percent. This indeed means that there were 31 percent fewer heart attacks in patients taking the drug. But it also means that the “absolute risk” of a heart attack for any given person dropped by only 2.2 percent (from 7.5 percent to 5.3 percent). The benefit of Pravachol can be summarized as a 31 percent relative reduction in heart attacks — or a 2.2 percent absolute reduction. The microorganism is Proteus OX19. In most ways it’s an entirely ordinary little bacterium. Its one remarkable feature is that human antibodies for Proteus OX19 cross-react with the antibodies for Ricksettia — the bacterium responsible for the deadly disease typhus. Blood from a patient infected with Proteus Ox19 will give a false-positive in the most common typhus screening method, the Weil-Felix test. The heart of the new first-year curriculum is a series of eight multidisciplinary courses, called Organizational Perspectives, structured around the organizational roles a manager must engage, motivate and lead in order to solve problems — or make progress — within organizations. These roles are both internal — the Innovator, the Operations Engine, the Employee, and Sourcing and Managing Funds (or CFO) — and external — the Investor, the Customer, the Competitor, and State and Society. Each course — titled to reflect these roles — draws on topics and insights from a variety of functional management disciplines to study the managerial challenges each role presents. 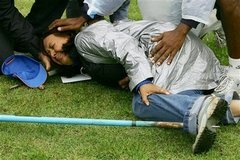 Track and field line judge Lia Mara Lourenco is helped after a javelin hit her in her foot during ‘Brazil Trophy,’ a national track and field competition, in Sao Paulo, Brazil, Sunday, Sept. 24, 2006. What if you had a really lousy job? You’re only employed for seven hours a day, but you have to ride the bus for half an hour each way. While you’re there, they only let you go to the bathroom at certain times. You only have ten minutes to get from one work station to another, and somehow you also have to use the toilet and get your new work materials from a central depository during those breaks, without being late. If you do anything wrong, you aren’t allowed to talk to anybody during lunch. Even when you go home, it’s not over. A job supervisor also lives in your house, and makes you do two or three more hours of the same work you did on the job. The at-home supervisor is even harsher than the one at work and has more power to inflict annoying punishments if you fail to comply. If you’re sick and miss a day or two, then when you get better, you have to do all the work that you missed — both the on-the-job and the at-home tasks. Not only that, but you can’t quit this lousy job. It’s the law — the government requires you to stick with it for at least ten years. That’s a fair description of the lives of far too many of our school-age children. But let’s pretend that grades and standardized tests actually measure something meaningful, and better results on those would mean that homework accomplishes something. That’s what a researcher named Harris Cooper did, according to Alfie Kohn, in his book The Homework Myth: Why Our Kids Get Too Much of a Bad Thing . Cooper looked at a number of different studies of homework and sifted and combined the results to see if some kind of definitive answer emerged. It did — but Cooper apparently didn’t see it himself. And yet when Cooper reached his own conclusions at the end of his published report, he came up with the oft-quoted formula that the ideal amount of homework is ten minutes per grade level per night. That would mean almost an hour a night for fifth graders — even though Cooper’s own meta-study found that there was no evidence that any homework for elementary students had any benefit. Apparently, we have a problem when “science” is done by true believers. Even when Cooper’s study found no defense for elementary-school homework, he still found a way to recommend in favor of requiring some anyway. Here’s a remarkable video shot from the cockpit of a radio-controlled airplane. The camera’s video is transmitted to the flyer on the ground below, who’s wearing VR goggles. When he moves his head, the remote camera’s pans and tilts correspond exactly to his movements. The result is a extraordinary feeling of actually being in the plane. Shouldn’t all R/C airplanes be made this way? And what form does that shortage take? It’s exactly like 1979 … long lines, gas stealing, gas stations running out without notice. Terrible rationing. What doesn’t happen? The price doesn’t increase much above $3.50 … which by 2016 will be about $2.70 in today’s dollars, so apparently the first effect of this terrible shortage is that the price falls. People are queuing for hours, but apparently not one enterprising station manager thinks to raise the price. And since the price doesn’t rise, people spend all their time trying to find stations with gas to sell, rather than looking for ways to cut down their usage. Is this the result of some strange industry practice? Government action? You wouldn’t know it from the script. Apparently, people in 2016 are very, very stupid. Actually, the problem is that they assumed that a shortage would be just like the 1970s. Except, of course, that the 1970s were like the 1970s because of Nixon’s wage and price controls, which meant that the price couldn’t rise to adjust for lower supply. Note that after Katrina, shortages lasted a couple of days … and then prices rose, people cut back on labour day travel, and supply and demand came back into balance. The other economic crime in the show is that the shortage happens all at once. In fact, of course, the supply problems would take years to develop, and would cause a long appreciation in price, accompanied by spikes and falls as supply shocks developed and were resolved by decreased demand. People would move closer to work, get smaller houses, by smaller cars, and so forth, as gas and oil became increasingly expensive … not just wake up one morning and find that there was no gas to power their SUV. If a man goes into the forest and pokes a bear with a sharp stick, and the bear kills the man, whose fault is it? Don’t read this next part until you have made up your mind whether it is the man’s fault or the bear’s fault. Now substitute an irrational human being for the bear. The guy with the stick knows he’s dealing with an irrational and potentially violent person, and he pokes him with the stick anyway. Just like the bear, the irrational guy kills the guy who poked him. Whose fault is it now? Is it the fault of the irrational guy or the fault of the unwise guy who poked him? Okay, now suppose that the irrational guy is a specific kind of irrational guy – a literal believer in his faith. This is not an insult to the religious because even the Pope endorses the view that faith does not spring from rational thought. And let’s say this particular faith says that if ye poketh me with a sharpeth object, woe unto you, for I shall killeth! And let’s say the irrational person is completely rational in every way that is not related to his religion. He might even be an engineer or a doctor. But his irrational side is well understood by all. Now the guy with the sharp stick pokes him and gets killed. I think it’s instructive to look at what we do with man-eating — or even man-biting — animals: we “put them down” or lock them in cages. Everyone knows you shouldn’t poke a bear — or feed it, for that matter — but when a bear attacks people, people kill the bear. The Reconquista, viewed from today, more than five hundred years after its conclusion exhibits what is to modern eyes a strange reversal of roles. The Muslims were the cosmopolitans facing essentially backward tribesmen who sought shelter in the rugged terrain of the Iberian Peninsula. The Muslims had the contemporary New York and the Christians possessed the contemporary Afghanistan. Time after time the Caliphate launched punitive expeditions only to watch their efforts reversed as they left. The Christian kingdoms eventually enlisted demography into their arsenal of weapons. They would depopulate certain areas in order to create buffer zones against the Caliphs; and whenever they seized a town or city from the Moors they would immediately populate it with their own peoples to prevent its recovery. In its last stages the Reconquista became a literal Crusade involving all of European Christendom, a movement which had its own heroic figures, theorists and goals. Again the symmetry is striking. It is the Muslims who are infidels; and the Christians who create their own military-religious orders to defeat them. Twenty-two inches from quivering whisker to fat tail, they can chomp through concrete and leap more than two feet in the air. Sauntering down your street in broad daylight, insolently raising two claws to the binman, they rifle through your rubbish and scoff poison as if it was milk chocolate. There is something of the night and also something of the urban myth about the nearly indestructible super rat coming to a pile of carelessly discarded foodstuffs near you. But Britain’s pest controllers are adamant: they are receiving more panicky reports of rodent infestation than ever, and it does seem that our rats are evolving into something not seen before. A weapon is defined as a rifle, shotgun, pistol, airgun, [or] starter pistol. Yes, starter pistols — those little guns that fire blanks at track and swim meets — are considered weapons and do not have to be registered in any state in the United States. I have a starter pistol for all my cases. All I have to do upon check-in is tell the airline ticket agent that I have a weapon to declare. I’m given a little card to sign, the card is put in the case, the case is given to a TSA official who takes my key and locks the case and gives my key back to me. That’s the procedure. The case is extra-tracked. TSA does not want to lose a weapons case. This reduces the chance of the case being lost to virtually zero. It’s a great way to travel with camera gear. I’ve been doing this since December, 2001 and have had no problems whatsoever.